Nintex Forms offers many great features for designing and customizing your SharePoint forms. There are times when you need to pull in data to your forms from other sources, including other SharePoint lists. One way to accomplish this is to use the Lookup function, which allows you to retrieve data from a column within a SharePoint list and display that data on a form or use it in a formula. The Lookup function can be utilized within a Calculated Value control, Form Variable, or Rule. List Title – The title of the list that contains the data you are retrieving. The list can be in the current site or another site. To configure with a list on another site, start by prepending the List Title with the server relative URL path of the site and then delimit the list title with a pipe (|) symbol. For example, “/sites/siteCollection/siteName|ListTitle”. Column to filter on – The name of the column in the list that you want to filter on. This column is used to filter which list items are returned as matches occur against the third parameter. Value to filter on – The specified value that is compared against each item in the list. Be sure to use a Named Control instead of an item in the Item Properties tab for this value. Output column – The column name in the list from which the data is retrieved. Orders – This list houses the order form and stores the order information upon submission. List columns include Order Number, Product ID, Product Name, Production Description, and Product Cost. Product Information – This list is used to provide information about the products offered. List columns include Product ID, Product Name, Product Description, and Product Cost. Now that we have the required lists and columns in place, here are the steps used to configure the Product Information lookups in the Orders form. Open the Orders form in the Nintex Forms designer. Formula = lookup(“Product Information”, “Product ID”, ProductID, “Product Name”) where ProductID is the Name of the form control. Formula = lookup(“Product Information”, “Product ID”, ProductID, “Product Description”) where ProductID is the Name of the form control. Formula = lookup(“Product Information”, “Product ID”, ProductID, “Product Cost”) where ProductID is the Name of the form control. Publish the form and open it in the Orders list. Enter a valid value into the Product ID field on the form and go to another field. The form will automatically pull and display the data from the Product Information list into the Product Name, Product Description, and Product Cost fields. I can now add “Whitepaper Author” to my resume. Nintex recently published the “Transitioning from InfoPath to Nintex” whitepaper that I authored with their team. If you’re currently using InfoPath and are considering a move to Nintex Forms, this whitepaper will be a great resource for you. You’ll find information about Nintex Forms features and functionality, transitioning best practices, which forms make sense to convert, a real-world forms migration scenario, and what other organizations have to say about their transitioning experiences. “Microsoft has retired InfoPath but transitioning to a new forms solution doesn’t have to be daunting. And whether you use InfoPath or don’t use any forms solution, implementing Nintex Forms can result in increased productivity and other benefits for your organization. What features and functionality make Nintex Forms unique – and help customers like BGC Engineering successfully complete projects faster? What are best practices for transitioning to Nintex Forms? How do you identify which forms make the most sense to convert to Nintex Forms? What’s a real-world forms migration scenario? Download the “Transitioning from InfoPath to Nintex” whitepaper. I recently completed both the Nintex Workflow Pro Certificate and the Nintex Workflow Admin Certificate. The Workflow Pro Certificate is for skilled Nintex platform users and covers designing, creating, and debugging Nintex workflows and forms. The Nintex Workflow Admin Certificate is for skilled Nintex platform administrators and covers various abilities and knowledge including the installation and maintenance of the Nintex Platform. In this example scenario, a user fills out a list form to enter their name and pick their favorite SEC football team via a drop down list. The drop down list control pulls from a Teams list and is auto populated with a default team value (i.e. “Alabama Crimson Tide” in this case). So here’s an example of how to accomplish this solution. This solution works with both Nintex Forms 2010 and 2013. Create a list called Teams and add the team names. Add the ID field to the default view (this will be referenced later). Also note the Title field display name was changed to “Team Name”. Create a new custom list called “Favorite Teams” and add a new “Single line of text” column called “Favorite Team”. Also note the Title field display name was changed to “Your Name”. Create a Nintex Form in the Favorite Teams list (List Tools > List > Nintex Forms > Customize the Item Form). Delete the default Single Line Textbox control for the Favorite Team field. Add a List Lookup control to your form in place of the Favorite Team control you just deleted. Open the Control Settings for the new List Lookup field and configure it with the following settings. Source SharePoint site = (Insert the address of your site). Click the Refresh button to the right of the Source List option. Click the Save button the save your changes to the Control Settings. You can now use the form Preview to make sure the Teams are populated in the List Lookup control properly. 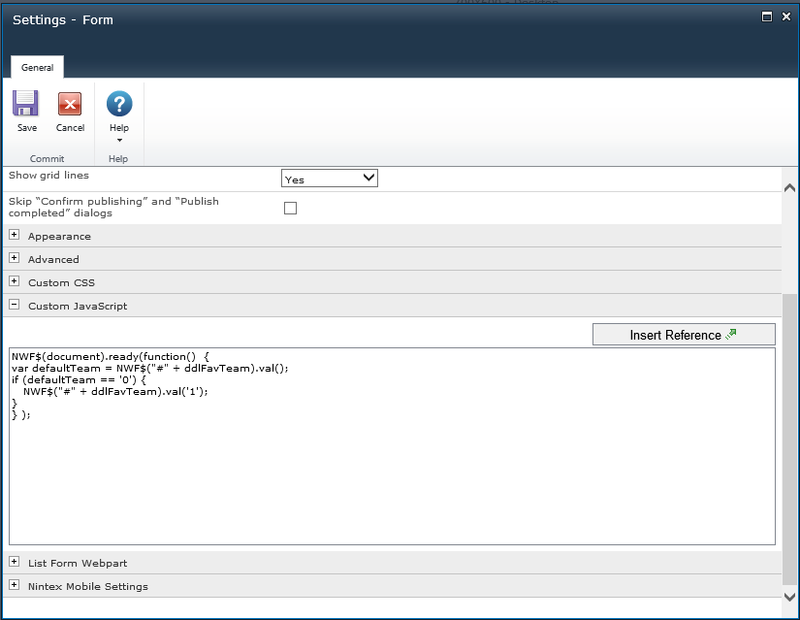 Next open up the form Settings configuration. Note: You may have to delete and re-enter the quotation marks and/or the single quotes if you copy the above code directly off the page. Sometimes the formatting does not copy over correctly. Go back to the FavoriteTeam List Lookup control and open the Control Settings. Expand the Advanced section at the bottom of the Control Settings and enter the following values. You can now use the form Preview to make sure the Favorite Team field is now auto populated properly. Publish the form to add items. You should be good to go! Today’s modern company is comprised of multiple offices, telecommuters, business travelers and clients on various continents in different time zones. In this global economy, business applications are required to meet the needs of each employee and customer whether they are in Atlanta or Hong Kong. No one wants to be sitting in an important meeting not being able to access and interact with the data and processes they need. This post examines the benefits of utilizing the powerful cloud features of Nintex Live with Nintex Workflow and Nintex Forms. Everywhere you turn, there is talk of business environments and applications moving to the cloud. Nintex began supporting cloud computing two years ago with the release of Nintex Live. Nintex Live allows organizations to connect on-premise SharePoint with Office 365 and other cloud services. Businesses can build hybrid cloud and on-premise solutions in one integrated system. Nintex Live enhances Nintex Workflow by adding more tools to the workflow rotation and connecting workflows across hybrid and distributed SharePoint deployments. 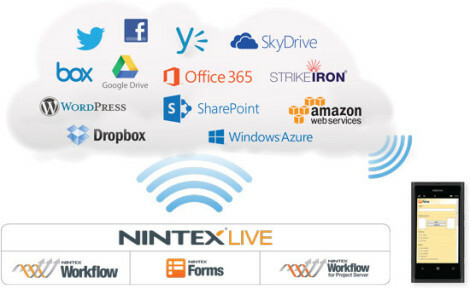 Nintex Live extends the reach of Nintex Workflow by connecting SharePoint to Office 365 and an ever growing number of cloud-based services. In addition to the existing 80+ actions in Nintex Workflow, Nintex Live offers an online catalog of enterprise and consumer cloud actions that further extend the capabilities of workflow applications. Businesses can easily add these actions to their Nintex Workflow toolbox and quickly utilize them in their workflow designs. Office 365 interactivity with libraries, lists and user management. Bing and Google utilities, such as language translation and URL shortener. Cloud storage actions for Box, Dropbox, Google Drive and SkyDrive. Social networking actions for Facebook, Twitter, WordPress and Yammer. With Nintex Forms, Nintex Live extends the reach of business forms to customers, suppliers and remote workers outside the firewall. Businesses can easily publish SharePoint forms to the cloud that are optimized for today’s tablets and mobile devices. Nintex Live lets users deploy web and mobile-enabled forms to securely capture important data and drive key business processes. These are exciting times with the recent release of SharePoint 2013. The roadmap for Nintex applications provides incredible options and flexibility for every organization. These innovations and enhanced features of SharePoint 2013 combined with Nintex Live in Nintex’s products will continue to give businesses innumerable benefits. I’ll be at the SHARE Conference in Atlanta helping out at the Nintex booth. Stop by and say hello if you’re there.